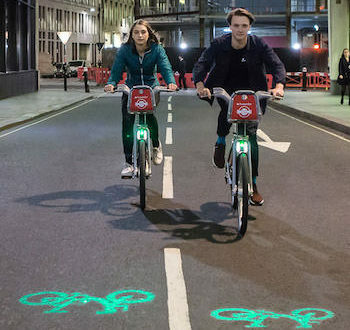 Emily Brooke’s Blaze has equipped the newest version of London’s public cycle hire bikes with upgraded laser lights. The new "Sadiq Cycle" – built by Pashley – was launched yesterday, and features a host of improvements. The new daytime running lights incorporate 24 super bright LEDs on both the front and the rear. Patented laser projection technology also shines a green bike icon ahead of the rider, providing a forewarning to motorists and pedestrians. The new technology solution – which Blaze has named Smart Lights – was developed in-house from Blaze’s studio and workshop in Shoreditch, East London. The lights also incorporate a GPS, accelerometers and atmospheric sensing to monitor overall journey quality. The front and rear lights stay illuminated for two minutes after the rider stops moving. Blaze design director Daniel Barnes said:, “These smart lights are the culmination of two years of R&D from our product team. The opportunity to be involved as a technology partner from the inception of the project has allowed us to achieve an unprecedented level of integration with the design of the bike." Blaze started out as a manufacturer of the consumer version of the new icon light, the Laserlight.